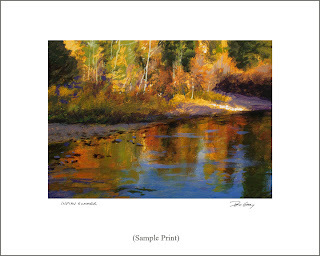 You can have a beautiful, long-lasting giclee print of any painting on my blog. I hand-produce my own open edition prints on an archival pigment ink printer. They are made one at a time, at your request. The inks are highly permanent and the images are printed on heavyweight, archival art paper. I hand-sign and title them in the lower margin. The prints of dailies are the same size as the originals, usually 5" x 7" or 6" x 6," on 8" x 10" sheets. To purchase: Email me with painting titles and quantities desired. Let me know if you want to pay by check, or if you prefer to receive a PayPal invoice, which allows payment with credit or debit card. Larger prints: I can also produce prints of larger paintings, up to the 13" x 19" sheet size that my printer allows. Email me with the title of the painting for individual size and price information.